September 18th, 2018: Public Affairs office at Fort Polk notifies organizations on their “Army Approved” 501c3 list, this list was created 2+yrs ago. The official communication, as seen below, reports that 29 horses have been captured. However, initial eye-witness reports state that there were actually significantly more horses captured. It was reported that 3 haulers picked up horses that day; a hauler for Freedom Reins picked up 16, hauler for Baby Girl Horse Rescue and Veteran Therapy picked up 7, and the 6 remaining went to a group known as Oasis Ranch. The hauler of “The 16” decided it was a good idea to lasso and tie a wild stud to the inside of the trailer which contained 15 other wild horses; 11 mares and 5 studs.. Then then trailer gets stuck in the mud and the hauler proceeds to “gun” the truck back an forth in an effort to get it unstuck with a full trailer holding 16 wild horses. The tied horse already beaten and terrified, lost his balance and was strangled to the point that the horse passed out. The horse was then trampled by the other terrified wild horses on the trailer. It was reported that one individual had to jump up and cut the rope so that the horse would not die. These 16 made their was to Eunice LA where they were to be held for Freedom Reins. The vet determined that the horse who was tied, strangled, and trampled in the trailer required his eye-removed due to injuries sustained during pick up / transport. He and 3 others were also gelded the same day. Those attending witnessed rough handling, indicative of what was witnessed on hauling day, as well has cruel treatment of the wild horses. Advocates responsible for the horses were not allowed to check on the horses for 3 days after the geldings and eye-removal. It wasn’t until the October 2nd that advocates were allowed to check on the horses. That same day the fifth stud was gelded and all the studs were moved to a different location, still under the purview of the hauler. October 3rd, 2018 – Received word that one of the studs was found dead in the pasture. This was not the stud whose eye was removed but the white stud who was beaten with the PVC pipe and collapsed on gelding day. While grass roots organizations try their best to manage the flood of wild horses evicted by the Army, the fact remains that the minute these horses lose their freedom and fall into the hands of people who don’t respect what it means to handle a wild horse, the more they are potentially subject to abuse (as seen at the of video), subject to aggressive training at break-neck-speed, neglect, and potentially slaughter. In addition, breaking a newly captured wild horse to ride in under 2 weeks does not ring of natural horsemanship and frankly these horses should not be subject to this kind of treatment. Not to mention the genetic line and long term viability of these genetically significant herds becomes increasingly threatened. These genetically significant horses were not raise as livestock and therefore should not be subject to the same treatment. These are wild horses who find comfort in their herd families and know nothing more than their freedom. 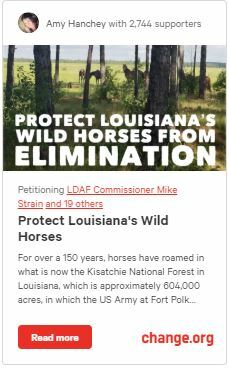 The video shows the difference in the horses overall well-being and attitude; comparing day before pick up and day after and tells the story of what they have been going though since being captured and evicted from their wild existence in Kisatchie National Forest. Previous Post Preliminary Genetic Analysis Reveals Fort Polk Horses have Strong Spanish Associations, Unique in Remaining Wild Herds.